As early as the 1690s, manufacturers in Wales developed a protective coating for the newly developed material of sheets of tinned iron. By baking layers of opaque varnishes of asphaltum (black/brown bituminous resin) and other colorants in a linseed oil medium, they created rich, dark surface coatings for metals. This Western process was generically called japanning, a term inspired by the look of desirable imported Asian lacquerwork. 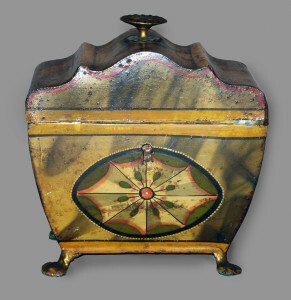 Merchants soon applied the term japanned to colorful, painted tinware whether it was varnished or not. 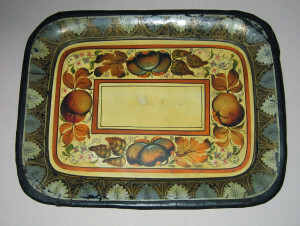 Tray, made in Pontypool, Wales or Birmingham, England, 1740-60. Bequest of H.F. du Pont, 1958.2282. 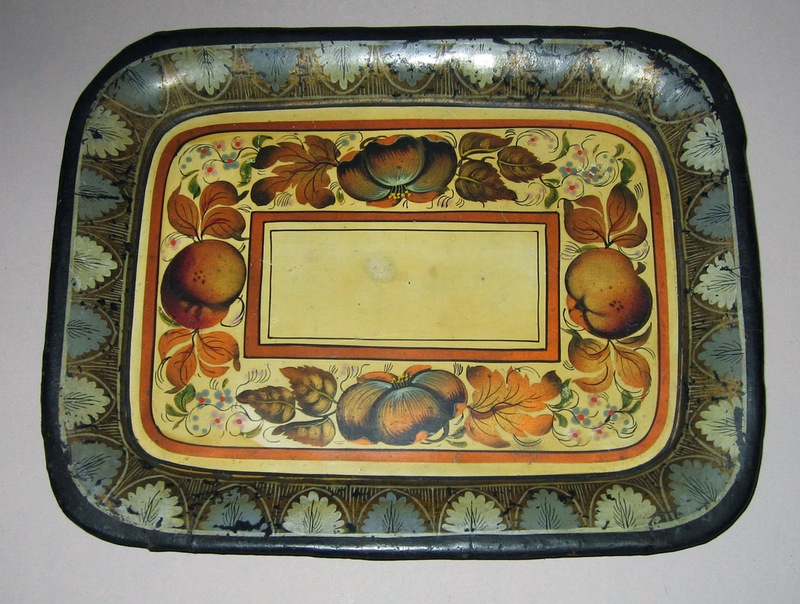 The black, red, and golden brown varnishes in the ground of this tray imitate the look of exotic tortoiseshell. The decorator painted an idyllic shepherdess in a whimsical Asian landscape to appeal to customers seeking the look of costly imported Chinese wares. This diminutive yellow tea or hot water pot rests on a conforming pierced stand that conceals a small lamp. The design kept the beverage contained in the pot just the right temperature. Its delicately delineated landscapes are framed by green borders with applied gold leaf designs. 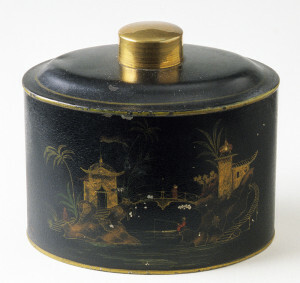 Tea canister, made in Wolverhampton, England, 1800-50. 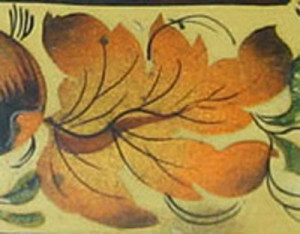 Demonstrating a different decorative painting technique, this English tea canister has ground colors that resemble marble made by using candle smoke to “smoke grain” the surface. An elliptical patera, a geometric motif inspired by antiquity, fills the side. This oval tea canister is lacquered with numerous layers of black urushi (natural resin used in Asia). When H. F. du Pont acquired the canister, the seller said he thought it was made in the mid-1700s in England. 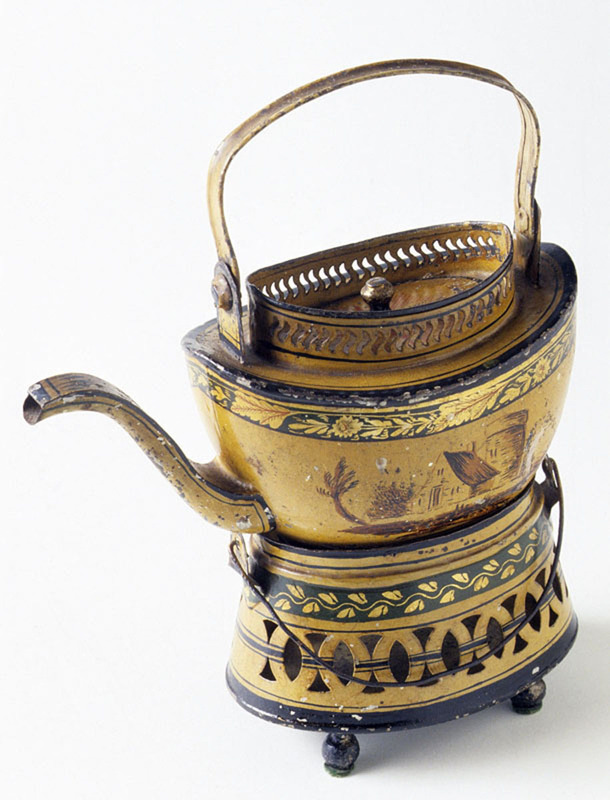 Recent analysis of the surface indicates it was mostly likely made and lacquered in China soon after 1815 when the pigment chrome yellow became available. Druggists and commercial paint suppliers offered tinware decorating materials such as oil paints, naturally derived colored varnishes, and colored bronze powders. 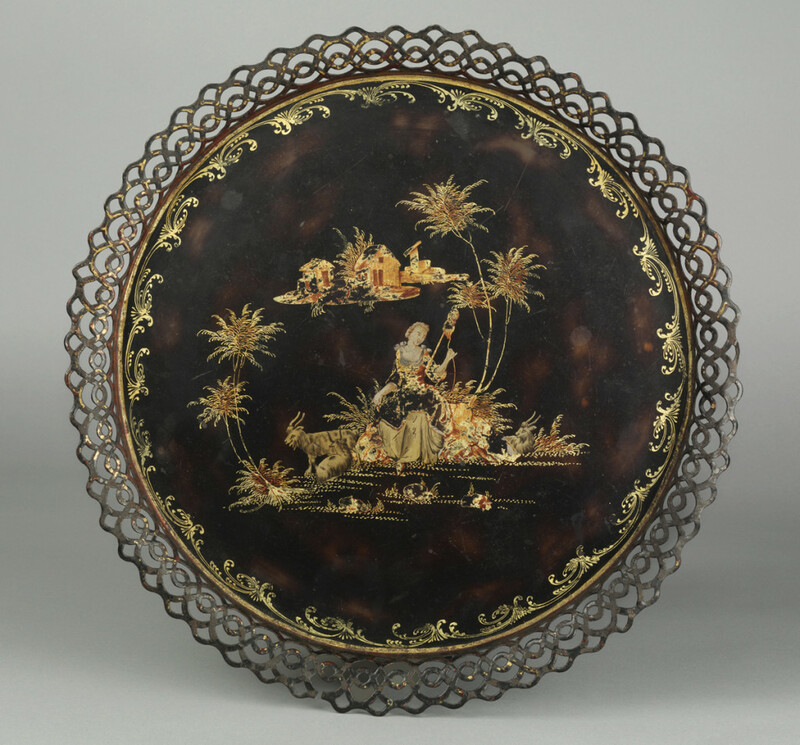 Sophisticated decorators enriched surfaces with gold leaf and bronze powders applied onto tacky varnish, as can be seen on the fruit and leaves ornamenting this English tray made in the mid-1800s. Tinsmithing proved to be a profitable profession during the first half of the 1800s. Expanding markets for household items and tea wares in England, France, Scandinavia, the European colonies, and the United States soon outpaced the quantities produced by British and French suppliers. Sizable manufactories were established on both sides of the Atlantic. published in Esslingen am Nekar, Germany, ca. 18–?. Early tinsmiths’ shops often included a master craftsman, one or two trained tinsmiths, and one or more apprentices. 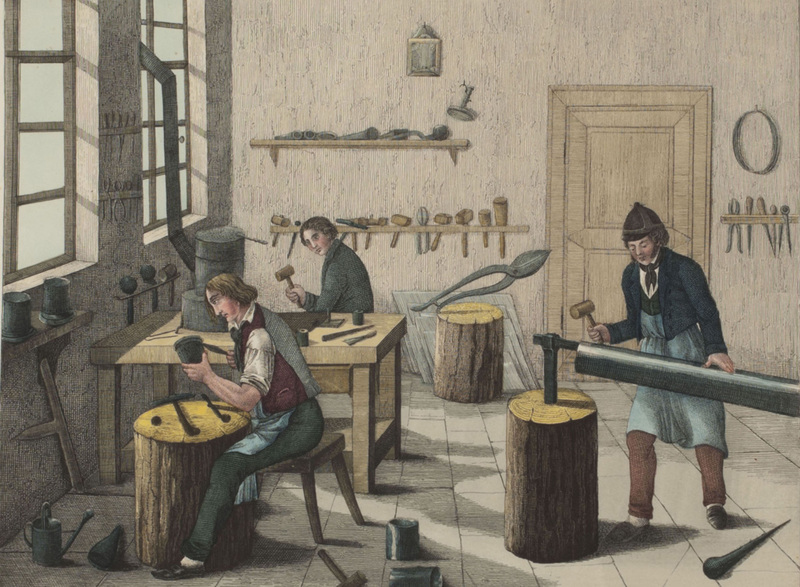 This idealized German workshop depicts men using hammers and stakes to create typical wares used by households in the early 1800s. The standing tinsmith uses a mallet to shape a cylindrical tube much like the stove pipe in the opposite corner of the workshop.